For infants, baby carriers make the transition from the womb to the outside world easier, close contact keeps baby near mom’s beating heart and keeps the constant motion they experienced in the womb. A parenting favourite for its comfort, style, and adaptability, the award-winning MOBY Wrap is made from soft, breathable, durable fabric that evenly distributes the weight of carrying your baby across the back and hips and provides the perfect snuggle for newborns, infants, and toddlers. Soft and breathable, the durable 100% cotton textile in the Classic wrap keeps little ones in a comfortable position for long periods of time. Start by wrapping yourself. There is a rumor that it can take a few tries to learn to wrap, but you will soon get to know your Moby Wrap and become familiar with how tight you will wrap yourself and as baby grows you will naturally adjust for your growing baby, wrapping for the perfect fit every time. 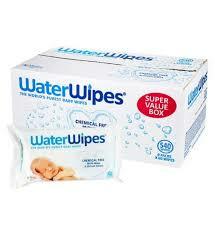 For newborns an inside pocket is created where the fabric comes from your shoulder and crosses your body. This pocket will hug your little one, allowing them to stay in an upright fetal position that is so important in this stage of development. For older babies, baby comes in and sits on the X created by the crisscrossed fabric at your chest. 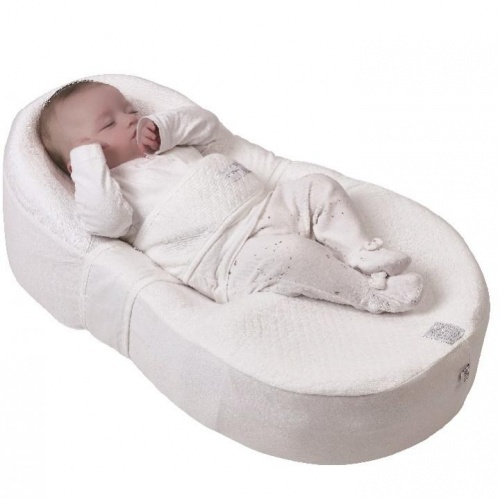 This X cradles baby in a deep seated position that supports the natural curve of baby's spine and while allowing you to spread the fabric wide to reach from knee to knee. Nursing in a Moby is a wonderful option for breastfeeding mothers. We recognize that every mother/baby nursing relationship is different. Therefore, our Moby carriers provide a variety of options for breastfeeding so you can discover what works best for you. Many mamas find success nursing baby upright in the Newborn Hug or Hug Hold. This is a great option for babies who have adapted to latching on in a vertical position. 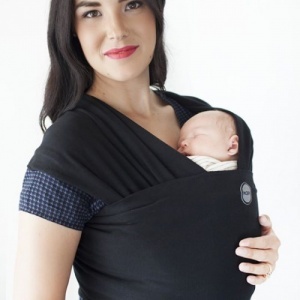 Many moms report that they love the simplicity and ease of breastfeeding their baby this way in a Moby Wrap. For moms and babies who prefer to nurse in a horizontal position, for safety, we recommend taking baby out of the Moby Wrap to nurse, leaving the Moby Wrap on mom. Once baby has finished breastfeeding, baby is easily put back into the wrap in an upright position. No matter which method you choose, the Moby Wrap has the added benefit of being a discreet, convenient nursing cover! When using a Moby Wrap while breastfeeding, use your arms to support baby. After feeding, always move baby's face away from the breast and re-position upright.